PRODUCT: 12" Diameter (15" Bowl), PVC Roof / Deck Drain Kit. Rubber coupling fits 6" Pipes. Complete with molded PVC body, epoxy coated cast aluminum alloy clamping ring with gravel stop, polyurethane dome, cast aluminum under deck clamp, rubber coupling, Hardware. (AKA Marathon Enpoco BS-1087) Price/Kit. DESCRIPTION: The PVC Roof Drain kit includes the roof drain with a cast under-deck clamping ring, PVC pipe extension and rubber connector with clamps. Drain construction is a molded ultraviolet stabilized 12-1/4" OD x 5" high polyethylene dome strainer (15" Bowl), a 12-3/4" diameter epoxy coated cast aluminum gravel guard and clamping ring, an injection molded ultraviolet stabilized PVC drain body, a cast aluminum under-deck clamp and a flexible rubber pipe connector with stainless steel clamps. Drain construction is a molded ultraviolet stabilized 5" high x 12-1/4" diameter polyethylene dome strainer, a 12-3/4" diameter epoxy coated cast aluminum gravel guard and clamping ring, an injection molded ultraviolet stabilized PVC drain body, a cast aluminum under-deck clamp, and a flexible rubber pipe connector with stainless steel clamps. 12" diameter poyurethane strainer dome. 12-1/4 in. DIA. BASE X 7-1/4 in. 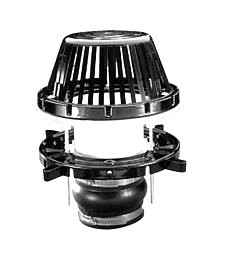 HIGH, REPLACEMENT BLACK DRAIN DOME / STRAINER/ GRATE. UV RESISTANT POLYETHYLENE. BASE FLANGE IS .430 in. WIDE x .185 in. THICK. REPLACES POPULAR B2-DM PLASTIC DRAIN STRAINERS / DOMES. PRICE/EACH.